Even among the small group of people who are familiar with open source, the phrase “open source hardware” applies only to electronics. That might have been accurate in the past, but projects like Wikispeed are blazing a trail for practical HARDware projects. Like an entire car. Team Wikispeed formed around Joe Justice when he was competing in the Automotive X-prize. Due to Joe’s day-job as a lean/agile coach, Wikispeed (which means fast-fast) adopted management practices that are normally only associated with software projects. By working in modules the team was able to rapidly iterate the design of the car. Basically, a change to one part of the car had no effect on the rest of the car. This was particularly important as the X-prize kept changing the rules of the competition. By the third change some teams had to simply drop out of the competition because they couldn’t afford the time or money to redesign their car. Team Wikispeed merely changed their suspension modules. The car they built, SGT01, ended up beating out most of the other entries and was invited to the competition. Due to technical and cultural errors the car never actually drove on the track, but that hardly dampened the spirits of the team. There is an excellent writeup in Seattle Met. Thanks to the culture of innovation and high morale Joe has maintained, Wikispeed is still going strong. Additionally, Joe and the team have joined forces with Open Source Ecology to officially open source the design of the SGT01. Documentation is being built on the OSE wiki. The Wikispeed SGT01 is modular. Most areas of the car can be altered or removed without affecting any of the other areas. Wikispeed’s approach to automotive design is an entirely new paradigm (yay hyperbole!). The design of the SGT01 goes beyond merely using interchangeable parts, like stock fasteners. The car is made out of modules that each conform to contracts (size, material, location, etc). This approach means that different parts of the car can be completely changed without requiring coordination with other parts of the car. The suspension module that normally mounts a tire could be swapped out for tank treads and it wouldn’t change anything about the rest of the car. This is a powerful concept that has the potential to dramatically change how people interact with their vehicles in the future. Basically, when support for this sort of standard becomes wide-spread, people will be able to swap out pieces of their car as easily as they swap out apps on their smartphone. Imagine having engine trouble; so you drive to the mechanic, he pulls out the engine unit, swaps a loner engine into your car, and you drive away 10-minutes later. When the mechanic finds and fixes the problem you return for another 10-minute swap and you’re back on the road. Perhaps you commute to work but also like camping in the mountains, so you have a sleek, aerodynamic car body during the week which you lift off and replace with a pickup-bed model for the weekend. 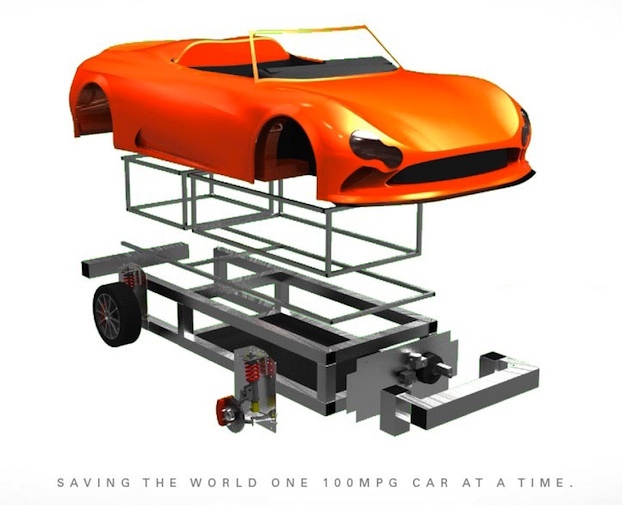 Most powerful of all is that once you own a modular car you are future-proof. Wikispeed’s current model has a >$8,000 engine and gets 100mpg. That’s with current technology. There is no reason the engine unit couldn’t have a stack of batteries and an electric motor, or a tank of hydrogen and a fuel cell, or dilithium crystals and a warp engine. If you buy a hybrid, and then a week later someone invents super-ultra-capacitors, you are stuck with the technology built into your new car. If you buy a Wikispeed car, and the next day someone invents an engine that runs on perpetual motion, all you have to do is buy that new engine and swap it into your car. You get to take advantage of all the best new stuff without buying a new car. Team Wikispeed is pressing forward on not only improving the SGT01, but also creating a second generation called the C3 (comfy commuter car). They expect it to cost between $15,000 and $25,000, to seat 4, to have a 5-star crash safety rating, and to get 100mpg. That isn’t a dream. The only real barrier between the SGT01 and the C3 is the lack of a roof.